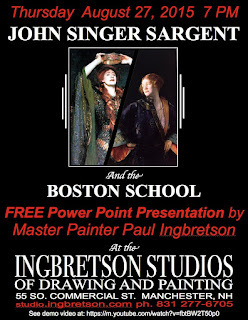 Paul Ingbretson is opening up his painting school, the Ingbretson Studios, this Thursday, to give a talk on one of the great artists of the naturalistic tradition, John Singer Sargent, and the movement that was inspired to a large degree by his influence, the Boston School of the latter part of the 19th century and early 20th century. 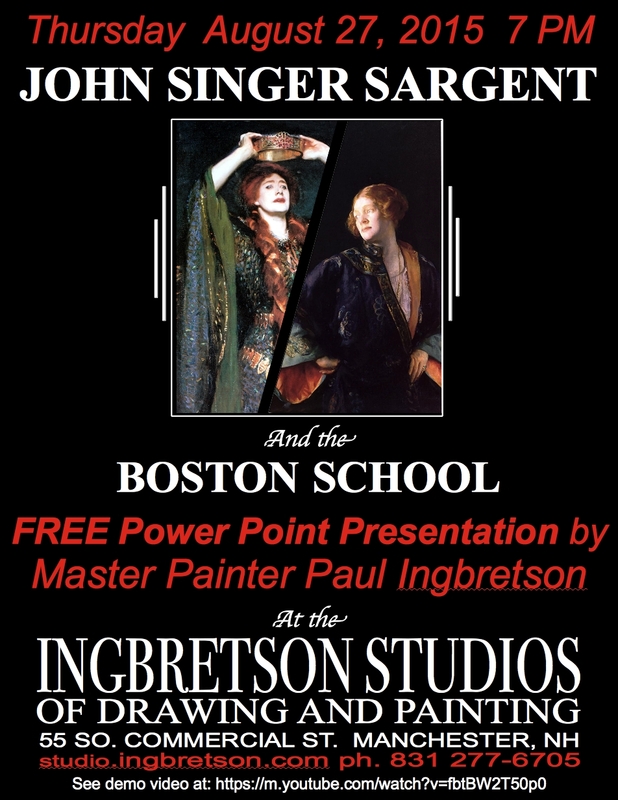 John Singer Sargent was not a religious man, and was not known for sacred art; neither was the Boston School. However, I recommend this talk for two reasons. First, because stylistically Sargent was an anachronism. Although he was trained in Paris in the 19th century, under the influence of his teacher Charles Durand (known as Carolus-Duran) he rejected the sterile neo-classicism of the French academy and its corollary, and the overly emotional portrayals of the Romantics, and strove to follow the style of the great Spanish master of the 17th century baroque, Velasquez. This was not a theological or philosophical decision, as far as I am aware, but based rather on his personal taste. He wanted to paint like Velazquez because he preferred his style. After training with Duran in Paris, he went to the Prado in Madrid, and taught himself further by copying every Velazquez on display in the museum. So, in his portraits and landscapes, he incorporates the essential elements of the baroque style, which is an authentically Christian style, and can be accounted for by a Christian worldview. This style is rooted in the religious art that grew out of the Catholic Counter-Reformation period. Therefore, anyone who wishes to understand the balance between natural appearances and idealization that must be present in all genuine Christian art could do worse than study the work of Sargent. Idealized naturalism is as much about what you don’t show as much it is about what you do. The artist controls the focus, the intensity of color and contrast of light and dark, in order to draw your attention to the important points of interest, which must coincide with those which we would look at naturally if we were presented with the scene itself. We are made by God to be curious about important things, and uninterested in unimportant things, and the artist must understand this. The other reason for highlighting this is to give a profile to Paul Ingbretson. One of the most important reasons that there are any ateliers teaching the academic style at all today is the group of young men trained in Boston in the 1970s under the guidance of almost the only remaining teacher of the academic style at that time, an octogenarian called Ives-Gammell. Paul was one of these young men who went on to devote himself to passing on to others what he learned. Paul is not Catholic, but he is, as far as I am aware, Christian. Certainly, his strong libertarian views mean that he encourages people of faith to connect this with their art when he teaches. This is not true of all the ateliers around, which can be just as aggressively secular in their worldviews as any other modern art school. Some of you may be aware of the Catholic painter based in Virginia, Henry Wingate, who paints portraits, still lives, and sacred art, and is one of Paul’s star pupils. The paintings shown here are by Sargent; the first is Gassed, which comes from his work as a war artist during the First World War, and shows soldier who have been blinded by mustard gas being led from the battle ground. 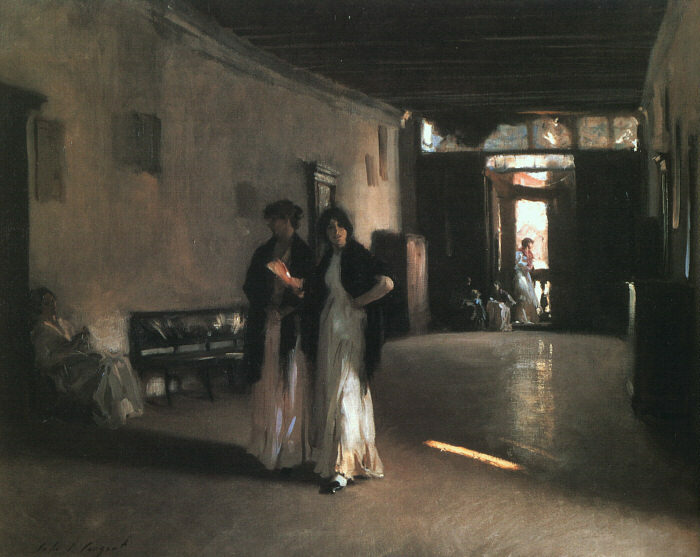 The second is Venetian Interior, in which we can see how much Sargent communicates by his use of colour (or deliberate lack of it), focus and contrast.